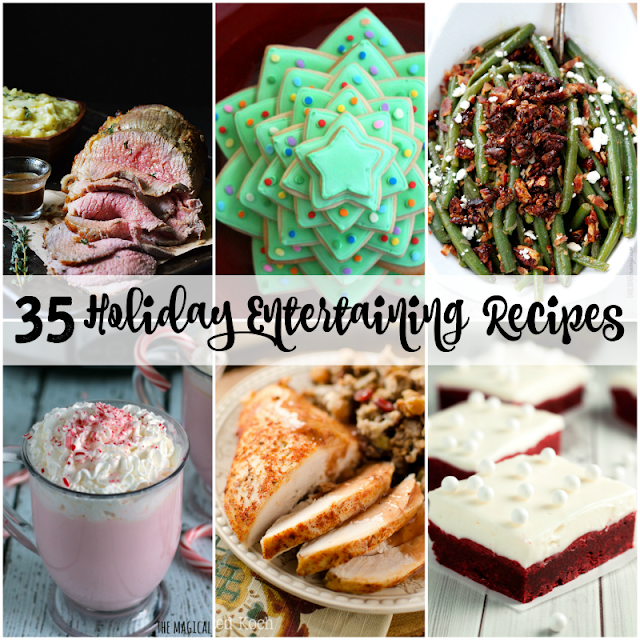 The busy holiday season is just around the corner, and I am already gearing up for holiday entertaining and the inevitable unexpected guests. One thing that you can never go wrong with when entertaining guests is dessert. Am I right? ;) That is why I like having a few easy, yet impressive dessert ideas on hand from Thanksgiving straight through to New Year's. 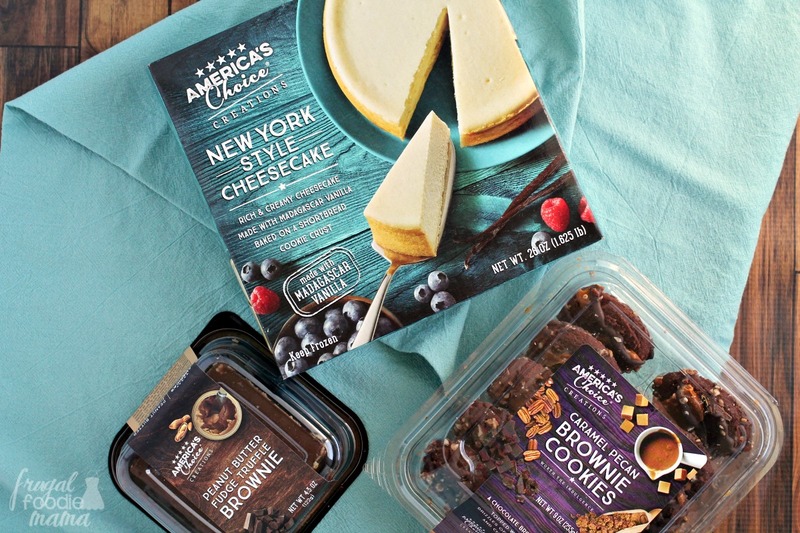 Recently I discovered the delicious & affordable America's Choice® Creations line of products at my local Save-A-Lot, and can we just say that I am smitten, folks? 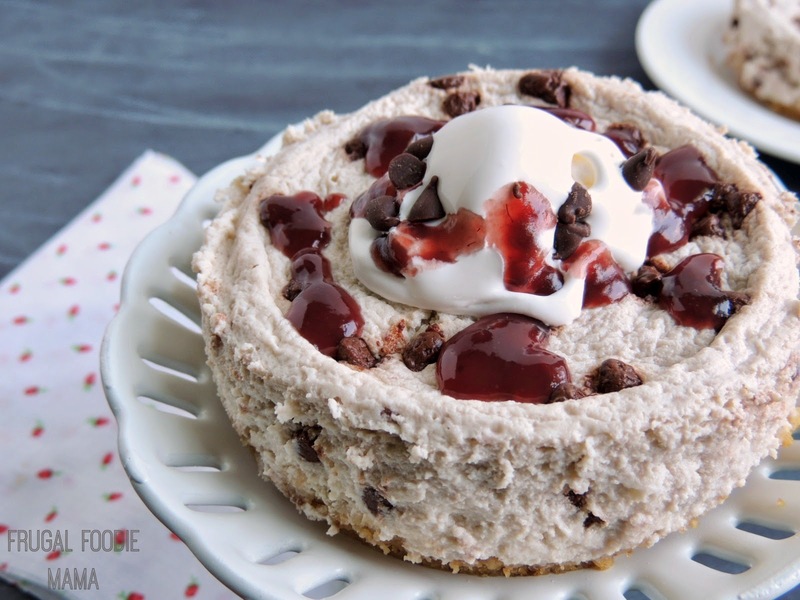 Remove the cheesecake from the freezer and allow it to thaw according to package directions. Once thawed, cut into 12 equal slices. Crumble 2 of the Pecan Caramel Brownie Cookies over a slice of cheesecake. 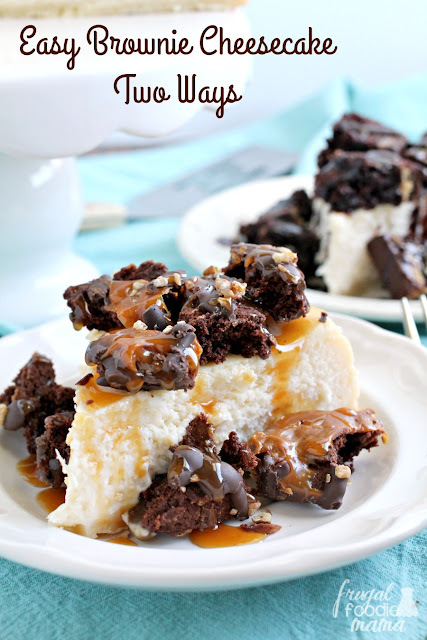 Drizzle with 2 tbsp of caramel sauce. 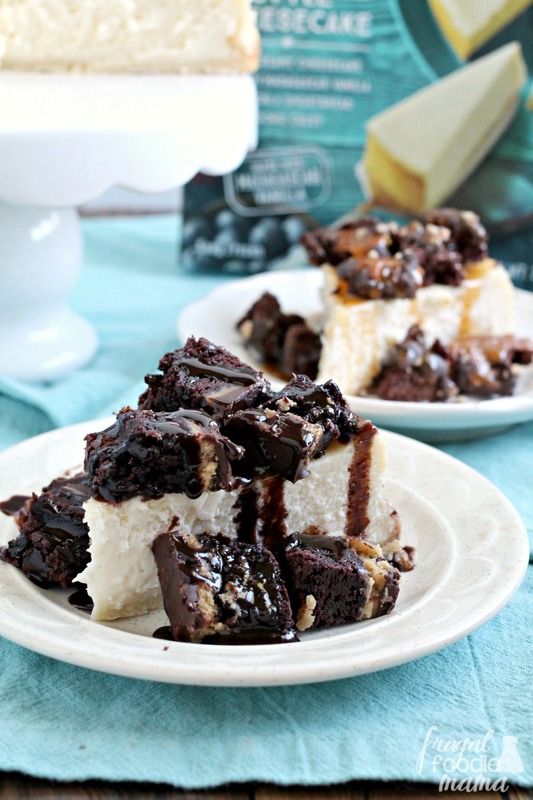 Slice off 1/4 of the Peanut Butter Truffle Brownie and then cut into smaller squares. 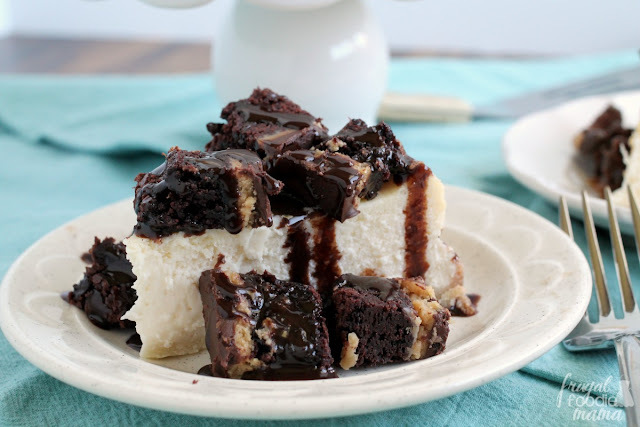 Top a slice of cheesecake with the brownie squares and then drizzle with 2 tbsp of chocolate sauce. Cover and store any leftover slices of cheesecake in the refrigerator for up to 5 days. My husband, who happens to be a cheesecake connoisseur, was really impressed with the New York Style Cheesecake. Creamy authentic style cheesecake infused with Madagascar vanilla nestled into a buttery shortbread crust- what isn't there to love?? 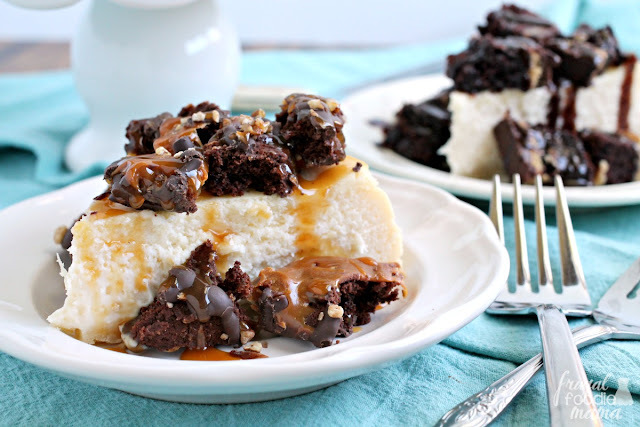 ;) And then top a slice of this creamy cheesecake with soft brownie cookie crumbles & a drizzle of caramel sauce, or with pieces of rich chocolate brownie layered with peanut butter & a drizzle of chocolate syrup, and you have dessert perfection in just minutes! Though I am definitely a big fan of the America's Choice® Creations desserts for quick holiday entertaining, I also like to keep a few of their easy dinner options on hand for those busy evenings during the holiday season when I don't have the time or energy to cook a meal from scratch. My family's current dinner favorites from the America's Choice® Creations line are the Black Angus Bacon & Cheddar Burgers and the Triple Pepperoni Pizza. A 6-pack of their Black Angus Bacon & Cheddar Burgers costs less than what I would pay for one fancy burger at a restaurant! Plus, how can you possibly go wrong with juicy Black Angus burgers packed full of aged cheddar and bacon? ;) And don't get me started on their Triple Pepperoni Pizza! A wood fired pizza is topped with gooey cheese and triple the pepperoni for a fraction of the cost of delivery pizza. Which of Save-A-Lot's America's Choice® Creations will you and your family be trying first? To find the Save-A-Lot store closest to you, CLICK HERE. And be sure to look for a 75 cent coupon for any America's Choice® Creations item in your local ad! And make sure to enter below to win one of two $25 Save-A-Lot Gift Cards to try their new line of America's Choice® Creations for yourself! See the terms & conditions in the Rafflecopter below.